Etrian Odyssey Nexus, a Western release of what Japan knows as Etrian Odyssey X, has been announced by Atlus. The title will release in America and Europe on February 5th 2019. 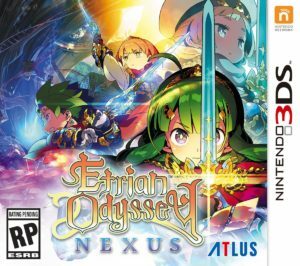 Nexus is essentially a Sonic Generations-type deal of the past Etrian dungeon-crawler titles, featuring classes, characters, and so forth from across the series’ history. The game is also touted as the series’ final installment on the Nintendo 3DS, of which there have been quite a few. As such, it’s intended to be a grand send-off for the series’ dual screen days – and it certainly sounds like one. It’s not the only Etrian-style title on the way for 3DS though, as spinoff Persona Q 2 is also on the way – set for a November 29th 2018 release date in Japan. Still no word on a localisation for that title, however. This entry was posted on Friday, August 17th, 2018 at 16:23	and is filed under News. You can follow any responses to this entry through the RSS 2.0 feed. Both comments and pings are currently closed.